HomeLifestyleLifestyleReligion in fashion: wholly necessary or holy vanity? Religion in fashion: wholly necessary or holy vanity? FFashion and religion have more in common than most may think: they’re both globally recognised and are expressions of our creativity and spirituality. The two interlink often- we recognise Muslim women through their hijab, the Pope wears elaborate headdresses and Indian Hindu weddings are renowned for their colourful, eccentric garments. Fashion brands are now utilising religious motifs in their designs-the most well-known example is of course Dolce and Gabbana’s Fall 2013 line, based solely on Sicily’s Cathedral of Montreale, with Madonna and Child paintings printed on dresses and heavenly romantic designs. Macy’s has now released a line especially for Muslim women and the Met Gala’s dress code for 2018 is Catholicism and fashion. The two seem to be intertwining now more than ever. High end fashion designers take divine inspiration from our sacred beliefs- Christian Dior saw a corseted male model take to the runway in 2000 dressed as a priest, complete with a headdress and dispensing incense. These creations haven’t always been received well. Chanel’s Karl Lagerfeld received death threats after he printed a verse of the Qur’an on the breastplate of a gown modelled by Claudia Schiffer in 1994. The legendary Alexander McQueen also had his say on the topic in his S/S line in 2000, which featured sequined burkas. All is well and good in the world of fashion, where the reasoning of self-expression and art deems all, but what about in the world of religion? Could religious allusions in clothing, mostly designed to be poured over for its beauty, kind of miss the point for their original purpose? Zaidat Olawale is a Tarbiyah officer in DCU’s Islamic Society, where she provides Islamic teachings. She explains that the use of Islam in fashion, although with good intentions, may be misconstrued. 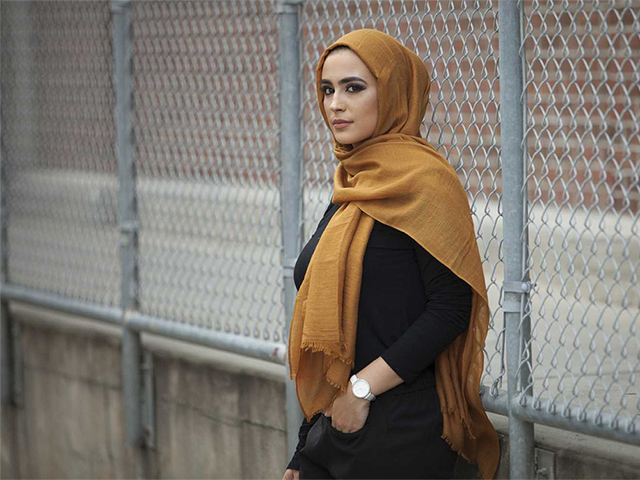 “Muslim girls like to be fashionable and trendy like everyone else, but the main difference is that elements of modesty should always be present,” she adds. Although many fashion brands have received huge backlash after using religious imagery in their work. This year’s Met Gala will see the theme of ‘Heavenly Bodies: Fashion and the Catholic Imagination’ worn by its prestigious attendees. Julia Brucculieri of The Huffington Post noted that “Right off the bat, outlets noted the theme could become the museum’s most controversial and provocative yet, Catholicism’s dogged history of sexual abuse aside. “It’s worth noting the Vatican is on board with the exhibit, which will feature religious items — papal robes, accessories and the like — alongside 20th-century fashions from major design houses,” she added. Religion is a part of many cultures, so it’s no wonder that its influencing fashion. The Jenner-Kardashian clan has been under fire many times for cultural appropriation, including Khloe wearing a Niqab during her time in Dubai. Fashion designers also source a lot of their inspiration from music- singers like Lana Del Rey and Lady Gaga have often made religious allusions in their work. However, Mark Caffrey, part of DCU’s Camino Society, believes that the fashion industry doesn’t understand the true meaning of religious symbols. “Early Christians began using [the cross] as a symbol of their faith and as a jest and boast to the Caesars of this world. They knew the power of the symbol. We don’t,” he said on the subject. “Yet, we’ve trivialised it and I’d argue it’s the symptom of a culture that is religiously illiterate. I’m not sure if we really understand the gravity of the claim represented by the cross. It’s unlikely that most people would use articles of clothing with a cross on it as a triumphant exclamation o the historicity Resurrection,” he added. Although fashion and religion will probably always cross ways, it seems like its often a touchy subject. Fashion sees itself as an art form and art normally likes to dip its toe in every part of society and culture- including our religious beliefs. However, as the Met Gala rolls around in May, it will be interesting to see the pieces that will hit the red carpet as the two worlds collide again.